WASHINGTON (WUSA9) -- Walmart donated $10,000 to provide 1,000 backpacks to children in DC's Ward 7 on Tuesday morning. Unity Health Care serves the children in Ward 7, via the Minnesota Avenue Health Center. "This program is another way we put our mission in action. We are thankful for the generous support of our partners at Walmart, who help us "promote healthier communities" one child at a time." Keane added. Currently, approximately 80,000 school-aged children live in the District of Columbia. Unity Health Care provides services to more than 105,000 people, 20,000 of whom are children. They give affordable health care for the uninsured, underinsured, homeless and working poor residents of our nation's capital. 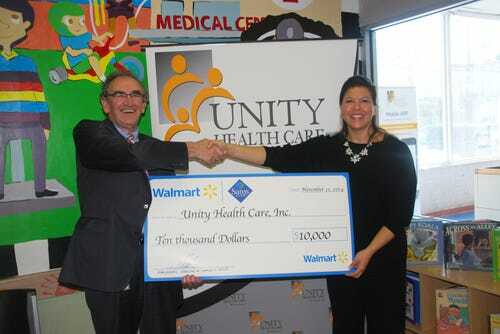 "Walmart is happy to support Unity Health Care; Unity is committed to caring for our children and has been on the front lines of promoting healthier communities for everyone in the nation's capital for nearly 30 years," said Nina Albert, Director of Community Affairs at Walmart. "Walmart values strong partnerships with not-for-profit organizations throughout the DC area that are doing remarkable work every day to improve the lives of local residents."